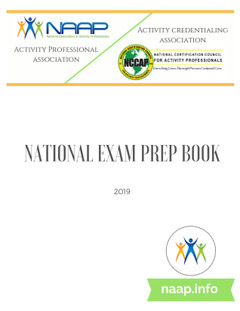 This research book, written by NAAP Board Members and a cadre of leading and nationally recognized Recreation/Activity Professionals, is ready for distribution and purchase! In addition, Activity Consultants, Staff Development Specialists and Directors can use the examples and essential experiences for training and professional development sessions in their very own health care community! The 200+ page book is filled with relevant, current and proven research strategies for today’s working Activity Professional.